Do You Know if There is A Pattern For This Quilt?? I Love This Quilt. Thread: Do You Know if There is A Pattern For This Quilt?? I Love This Quilt. I somehow stumbled onto this image on the webpage and I am in love with this quilt. I love how the 9 patches on point border the quilt. Has anyone seen this in a pattern before? I would need pattern help to make the "on point 9 patches" work out in length with the rest of the quilt. Basically, a square in a square (the inner square being the 9 patch, which is the same size as the blocks in the quilt). 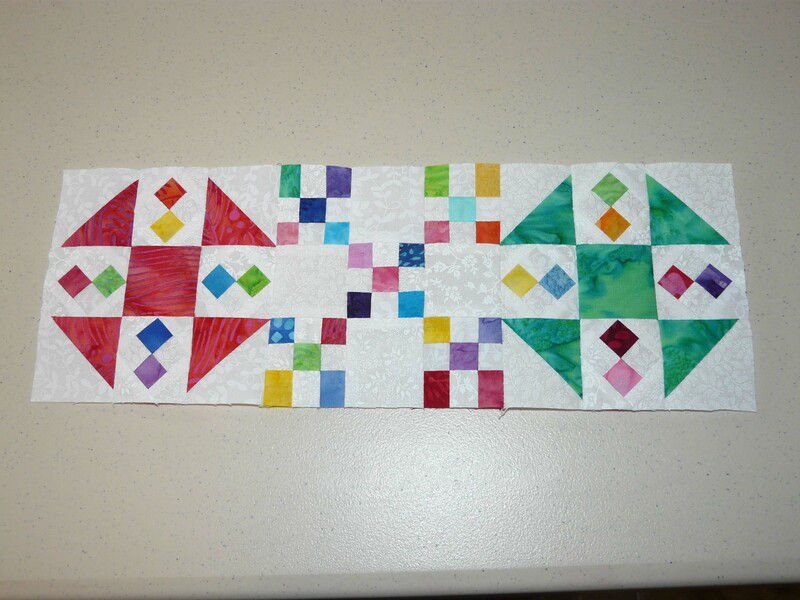 The key here is that red inner border, which is sized to make the border blocks fit exactly around the whole quilt. And in 1935, no less. Last edited by MTS; 11-14-2012 at 07:49 PM. 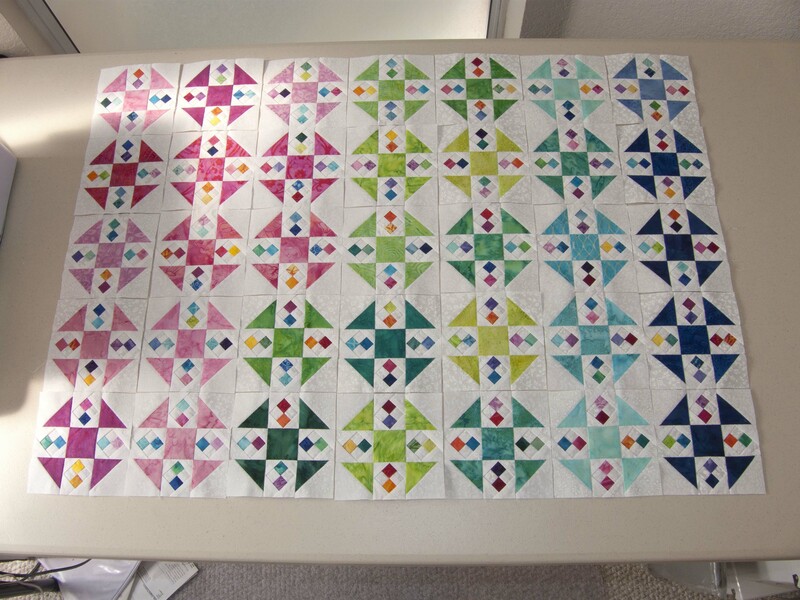 Assuming the 9-patches are 3" FINISHED, then the border square-in-a-square blocks would be 4.25" FINISHED. The inner border width is 2.25" FINISHED. Using those measurements, the quilt top would be ~ 85"x103" when fully assembled. Last edited by MTS; 11-14-2012 at 08:26 PM. Looks like an Irish Chain quilt bordered by a plain 1st border then 9 patches on point. Missouri Star Quilt Co. has a YouTube tute on how to make an Irish Chain quilt. Wow, MTS, you have a very sharp quilter's mind. Thanks. I am working on an Ohmigosh quilt and this little 9 patch quilt looks like a much smaller headache. I am going to have left a good portion of my 54 different fat quarters so I may do this quilt sometime in the future. That Ohmigosh quilt is quite an undertaking. I've seen if before but I didn't realize it was a Sue Garmen design. She's so talented - an amazing designer. Her BOM's for The Quilt Show were gorgeous. Good luck with both quilts. What a lovely happy quilt!!!! I am such a sucker for color/value gradiations. Fresh, bright colors. I love it! Very pretty pattern! I agree, looks like the simplest Irish Chain, which is just a 9 patch with the four corners and the center in colors. Can't get much easier. Right, it's a single Irish Chain. There's a cool video on how to make one on Youtube done by Jenny Doan of Missouri Star Quilting Company. I'm making a baby quilt for a co-working in the Irish Chain Pattern. Fun and simple. If that was the ONLY version of the block you made, you wouldn't get the same design as Elizabeth's lovely quilt. this is probably one of the situations where EQ7 would be better, but this one i designed in my EQ5. the quilt is 66x66 with borders of 1.5, 3, and 1.5. i cannot get the measurements for the patches of the 9p on point [i could probably do that with graph paper as the 9p's are 3" diagonally]. the inner blocks are 3". Sorry, GrannieAnnie, I read your post, incorrectly, as referring to the Irish Chain block (the larger double(?) 9-patch block ), and not the single 9-patch. Last edited by MTS; 11-15-2012 at 05:04 AM. t i cannot get the measurements for the patches of the 9p on point [i could probably do that with graph paper as the 9p's are 3" diagonally]. the inner blocks are 3". On your version, the 9-patches blocks used in the border would FINISH at 2-1/8, not a really fun size (17/8) to divide by 3. 3 / 1.414 = 2.122 ...round up to 2.125"
The beauty of Elizabeth's quilt is that the inner and outer 9-patches are the same size. eta: Not Elizabeth, but Shari's mom. Last edited by MTS; 11-15-2012 at 05:15 AM. The quote, from Elizabeth Ryan DeCoursey's book, is from 1935...the quilt, made by the blogger's mother, is new. since you are so good at the math, how wide does the on point border have to be to make the 9p's the same size as the inner section, 3" ? The 1.414 is just another of those frequently used numbers (like the 7/8" and 1.25") that is helpful to know., especially when dealing with on-point calculations (either way). Just make sure you always start with the FINISHED size of the block. Last edited by MTS; 11-15-2012 at 05:42 AM. Or if you REALLY hate math, use the chart for diagonals of a square. I love this! Curious what size is your blocks? I am not sure that I would do the border on point. Why not sew a right triangle on opposite sides of your nine patch? One of the right angles would go at the top and the other one on the bottom. Then you could sew those units together on the diagonal. I would cut the right triangles with the long side on the straight of grain to avoid the edges stretching out of shape.